When I awake I will be white, the color of law. I will be new, clean, good; and as pure as snow. experiences deja vu, as shadow-memory-feeling. (ever again) to prove myself Olympic, human or equal. My English, by fault of gaze (theirs), will upgrade. amputate my verbal nouns and double-descriptives. will want me in their anthologies but not as a colleague. my whiteness, and that blackness is behind me? The poetry in my walk will become prose. the first human bestseller, a Jigga Book Spook. It will be like having tenure, my value will be done. This is crazy, this lose-a-world way to whiteness. What happened to "smiling," to "playing the game,"
to being one of their favorites, to interracial marriage? so imagine what I will win when I become one of them. I can see it now, my MacArthur. Jungle eyes, a Guggenheim. but these lines, unlike the color line, were written to break. I am tired of lines, of waiting, of lies, my bio full of prizes. even if it means reintegrating another sinking ship. I'll be that Shine, defiant and drowned, dream alive. From Skin Inc. (Graywolf Press 2010). Used by permission. Thomas Sayers Ellis, co-founded The Dark Room Collective (in Cambridge, Massachusetts); and received his M.F.A. from Brown University. He is the author of The Maverick Room (2005), which won the John C. Zacharis First Book Award, and a recipient of a Mrs. Giles Whiting Writers' Award. 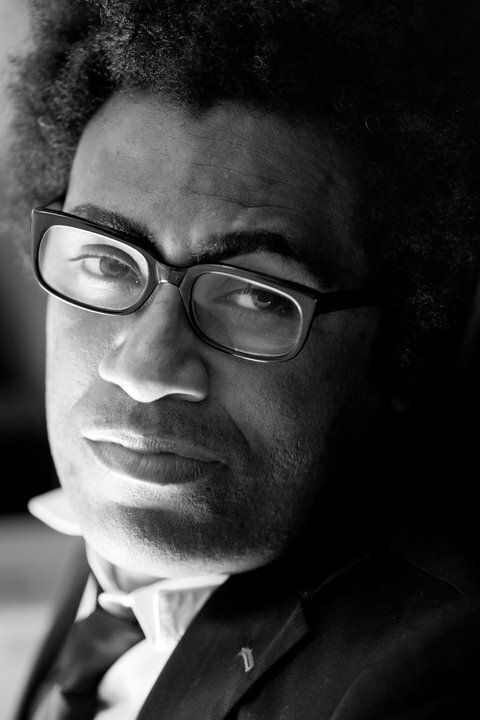 His poems and photographs have appeared in numerous journals and anthologies, including Callaloo, Best American Poetry (1997, 2001 and 2010), Grand Street, The Baffler, Jubilat, Tin House, Poetry, and The Nation. He is also an Assistant Professor of Writing at Sarah Lawrence College, a faculty member of the Lesley University low-residency M.F.A Program and a Caven Canem faculty member. He lives in Brooklyn, NY and is currently working on The Go-Go Book: People in the Pocket in Washington, D.C. His new collection of poems and photographs, Skin, Inc., hit the stores, streets, classrooms and web-rumor-sites yesterday. Ellis appeared on the panel Reclamation, Celebration, Renewal, and Resistance: Black Poets Writing on the Natural World at Split This Rock Poetry Festival: Poems of Provocation and Witness 2010. Some Great Coverage of "Howl in the City"